The 2018 Monster Energy Cup returns to Las Vegas for the Million Dollar Race on October 13, 2018 as the world’s most elite athletes compete for the largest purse in motorcycle racing. 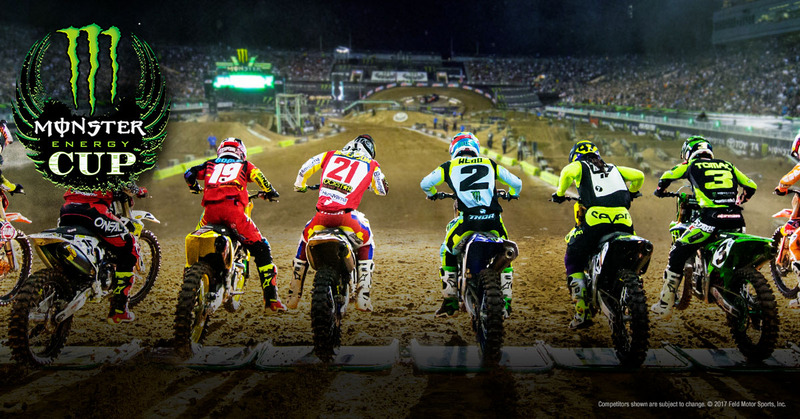 The Monster Energy Cup is one of the most anticipated invitation-only races of the year and unlike any other event in the world with a unique format giving the sport’s biggest names a chance to battle it out for the Monster Million, which has only been achieved twice since the event’s inception in 2011. Last year’s Monster Energy Cup winner, Red Bull KTM Factory Racing’s Marvin Musquin, became only the second rider in history to take home $1 million. This year, the world’s top two-wheeled athletes will return to lay it all on the line for a shot at the cash. Fans can enjoy a full day of entertainment at the Monster Energy Cup Pit Party from 12 p.m. - 6 p.m., including rider autograph sessions, live music and experiential elements. Pit passes are $20 each and can be purchased through UNLVtickets.com or 702-739-FANS, or get free access by recycling an empty can of Monster Energy. At the same time, inside the stadium, riders will be sharpening their skills during practice and qualifying for their starting gate position. order processing fee to be assessed at time of purchase. For more information or to purchase group tickets now, please call Group Tickets America at (702) 943-1515 x1 or e-mail Info@GroupTicketsAmerica.com.